The Tax Justice Network was launched on 24th March 2003 at a special event at the British Houses of Parliament. The launch came just months after the founding meeting in Florence, Italy, in November 2002, and followed a frantic period of drafting TJN's founding Declaration and Mission Statement. The launch was hosted by Austin Mitchell MP, and organised under the banner of Prem Sikka's Association for Accountancy & Business Affairs, which was also represented by AABA members John Christensen and Richard Murphy. The latter chaired the launch meeting. John subsequently became TJN's first Coordinator (later Director) alongside War on Want's Pete Coleman. A wide range of activists from across Europe attended the launch, including Sven Giegold, Bruno Gurtner and Andreas Missbach who had convened the founding meeting in Florence. The launch meeting included presentations from Andreas Missbach (Berne Declaration), Pete Coleman (War on Want), Bruno Gurtner (Swiss Coalition of Development Organisations, now AllianceSud), John Christensen (AABA), and Pat Lucas from ATTAC-Jersey. In her presentation, titled From Paradise to Pariah: Jersey's Road to Perdition, Pat lamented Jersey's take-over by international bankers and lawyers, and explained how sky-high house prices and a cost of living amongst the highest in the world had wrecked the island's domestic economy and corrupted the political processes. Pat and her colleagues from Jersey went on to play an amazing role in getting TJN started. We knew that funding was never going to be easy to source. Rich philanthrophists and corporate donors weren't exactly knocking on our doors, but neither were civil society organisations and cash-strapped progressive NGOs. 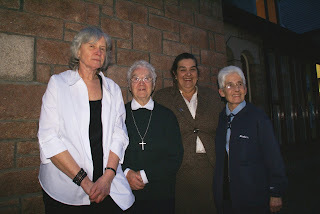 Happily, Pat (on the right of the photo above) and her colleagues Jean Andersson, Sister Peter, and Rosemary Pestana, plus many, many other friends from Jersey, just rolled up their sleeves and got to work. They organised tombolas, book stores, fund-raisers and all manner of whatnot. Within a matter of months they provided the financial means to get us started, plus a simple instruction: "rescue our island and close down these tax havens." We had lift off . . .